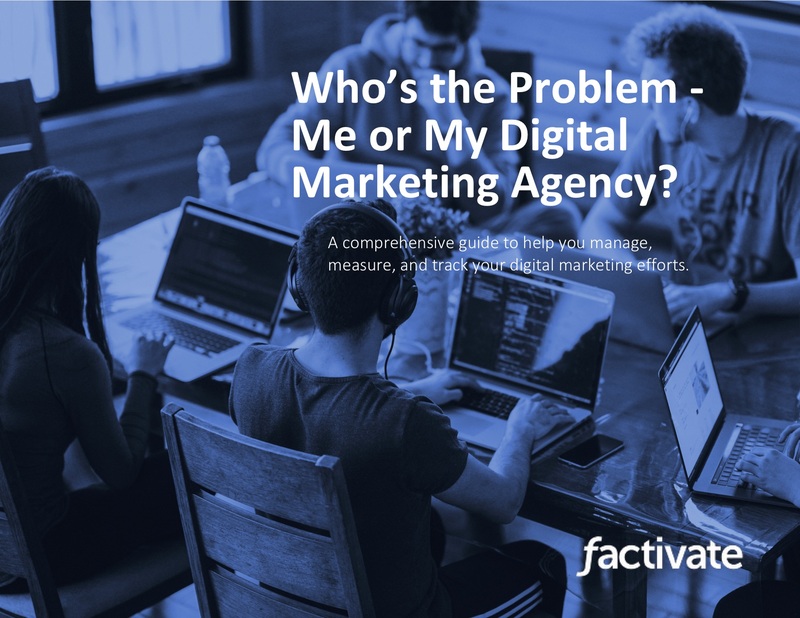 What are the best digital marketers doing differently from you that helps them: get your clients, get promoted, or even be 10 times more effective than you. It’s not that they’re smarter than you. It’s not that they know a secret algorithm that they keep to themselves. Absolutely not. Here’s the secret: Typical digital marketers implement marketing tactics hoping that they work or “sticks”. Great Digital Marketers, on the other hand, follow a process founded on data that either proves or disproves a marketing strategy. It’s as simple as that. Here’s how it usually plays out. Blindly change their website buttons to green because some article said to do so. Only post on Tuesdays because some article says to do so. Pay for cloud-based tools that provide data visualization because others do so. Run continuous experiments (and measure) to see what website buttons trigger the best reactions. Analyze their demographics, placement of content, messaging, and media to figure out when and where is the best to post an article. Only pay for tools that they can manipulate (without programming), have little to no learning curves, can automate their KPI reporting, and helps them make better decisions within the right timeframe. In short, great Digital Marketers approach their campaigns as small experiments before spending time/money (like a scientist would) whereas average digital marketers simply use the same old tactics used by traditional marketers. The spray and pray methodology doesn’t work in digital and if you’re still doing that, it needs to stop. In this post, we will showcase a step by step guide to help you become a great digital marketer. You don’t need any statistical expertise or engineering background to get it done. All you need is some basic spreadsheet knowledge and the ability to stick to a process. The scientific method provides a systematic way for you to solve a question by making observations and continuously experiment. The entire concept focuses on repeat experimentation in order to understand variables to ultimately lead to a predictable outcome. You don’t need to have an engineering or scientific degree to do this. With enough practice, you can follow this simple framework and become a great digital marketer with enough practice. By applying the digital marketing scientific method, you can end up predicting which marketing tactics will be most effective by running small tests to gather data. 1) Start compiling all of your marketing problems/ideas you can think of (or read) into your spreadsheet for digital marketing. In here, outline how long it will take to execute (input time) and how long it can take you to get accurate data readings from an experiment (output time). 2) Prioritize your marketing strategies based on how they fit with your goals. Then score them based on the probability of success, resources required, and impact. 5) Run your experiment(s). You should be able to validate your assumptions based on the 80/20 marketing experiment. Do this by breaking down your goal into week-to-week growth targets so that you can measure your progress. 7) Monitor and analyze your results consistently. If you can, have the spreadsheet open in a screen in the office 24×7 so that you (or someone in your team) can always look at it. To analyze your results, simply ask yourself why the experiment worked (or didn’t work). Identify the key variables that led to the success/failure so that you can make tweaks. 8. If the experiment was a success, apply your findings, and scale the experiment in iterative steps. Continue to focus on the marketing channel until it’s not as successful. There are thousands of marketing documents and white papers that should be used as inspiration and not as a copy/paste playbook for your business. The beauty of our spreadsheet templates is that they can be adopted and customized by almost everybody. Just be sure that you are using a systematic/scientific approach and you will instantly be on your way to become a great marketer. 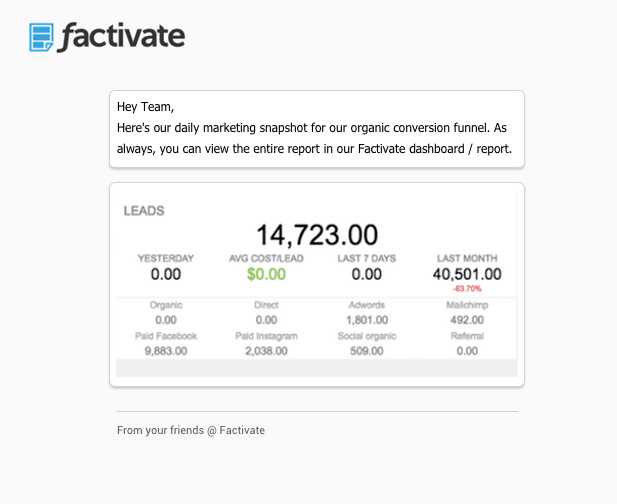 If you would like to see the spreadsheet template that we alluded to in this blog post, you can sign up for Factivate here.